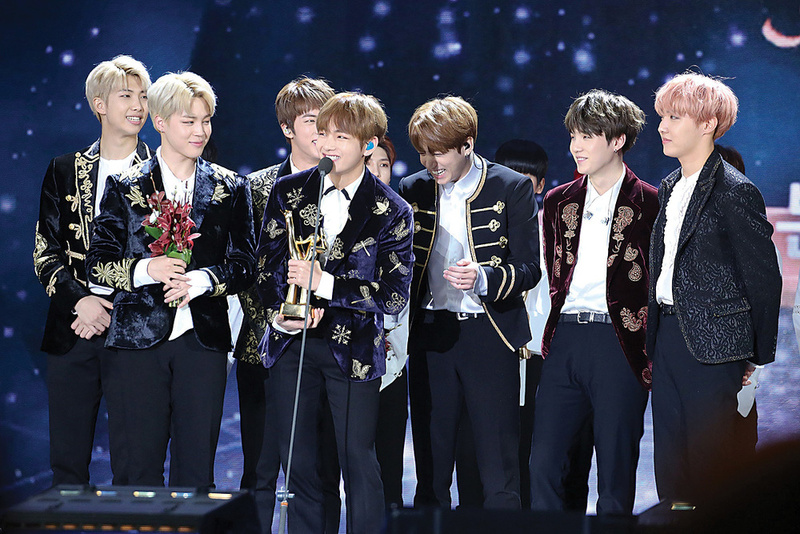 K‑pop is a truly global music style, and BTS’s successful assault on the US charts was led by a British mix engineer. 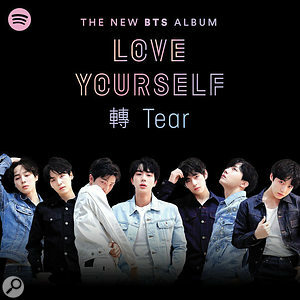 K‑pop band BTS, aka Bangtan Boys, made history in May when their third Korean‑language album, Love Yourself: Tear, became the first K‑pop album to reach number one in the US. The album was also a big hit in many other Western nations, including the UK, where it reached number eight. Following K‑pop’s first worldwide megahit, Psy’s ‘Gangnam Style’ in 2012, this was another landmark moment for Korean music. 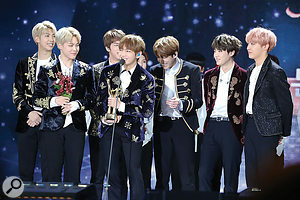 Bangtan Boys, also known as BTS, have become the most successful K‑pop band so far.Modern K‑pop has been around since the early 1990s, and draws heavily on Western popular music styles. K‑pop acts tend to be the South Korean equivalent of Western boy and girl bands, with attractive young singers performing music made for them by others, and BTS’s Wikipedia page states that the band were “formed by Big Hit Entertainment”, one of South Korea’s largest music companies. The seven‑piece have since become K‑pop’s biggest act, the most retweeted artist on Twitter, and this year topped the Forbes Power Celebrity list, which ranks the country’s most influential celebrities. BTS consists of three vocalists and four rappers, and unlike many K‑pop acts, band members often co‑write their songs. The band’s most prominent behind‑the‑scenes songwriters are Bang Si‑hyuk, aka ‘Hitman Bang’, the founder and CEO of Big Hit Entertainment, and Pdogg, winner of the Best Producer Award at the 2017 Mnet Asian Music Awards. Unsurprisingly, given that Western influences are dominant in K‑pop, Western songwriters, mixers and producers are regularly involved. In the case of BTS, the list included Chris ‘Tricky’ Stewart (Katy Perry, Beyoncé), top EDM artist Steve Aoki, and DJ Swivel (Beyoncé, the Chainsmokers). What Mr Bang found when he did his research was that Reynolds has an impressive list of credits, including Paloma Faith, Ellie Goulding, Emeli Sandé, Calvin Harris and Tinie Tempah. Presumably Mr Bang also noticed that Reynolds was an artist and beatmaker for many years, while the fact that he also is a baronet is obviously not relevant in this particular context. Reynolds, while proud of his family history, is discreet about it within the music industry. “I’m originally from Jersey and went to school in Sussex. I learned to play piano as a teenager, but wasn’t really planning on having a music career, until I hurt my leg badly in an elevator in Paris, and then spent a year recovering at home. This was in the early ’90s. During this time I started writing songs, and I bought a four‑track and some mics to record them, and that got my inquisitive brain interested in engineering. So I went on to study engineering at the Gateway School of Music at Kingston University. When I graduated in 1995 I hooked up with a wealthy gym owner who wanted a kind of Stock, Aitken and Waterman‑style production team. 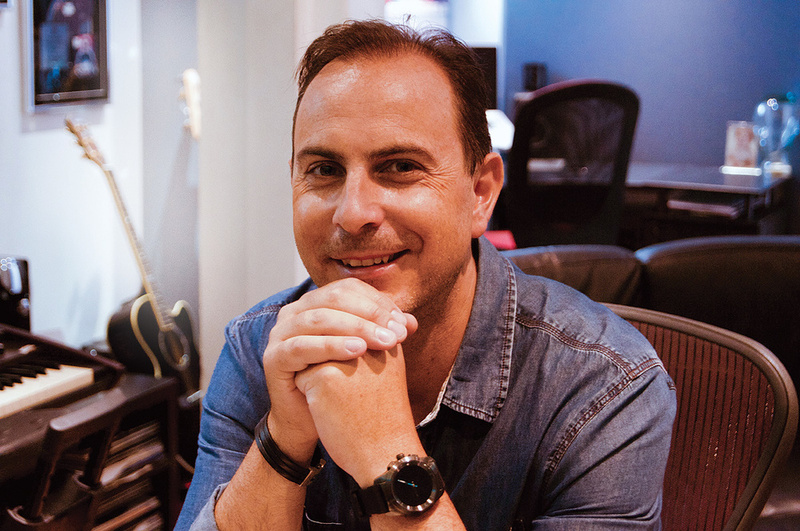 He had a studio called Hit House, and I brought in Matt Schwartz, who has since become a quite well‑known writer and producer, who has worked with Massive Attack and Trevor Horn. Together we made tons of records. “From there I went more and more into house music and made records with Soul Avengers, Hoxton Whores and Mark Knight, amongst others. Later I also was into garage. From my studio in Brick Lane [East London] I made tons of records for DJs, and also many records as an artist, under various names, like SuperMal, London Connection and Felix Baumgartner — the latter is my mother’s maiden name — and with Ben Braund in Braund Reynolds, and so on. I signed with Defected Records, a well‑respected house music label, and hooked up with singer Miriam Grey, and then with my manager, Dobs Vye, who turned out to be a great singer, and we spent five years making a record under the name Public Symphony [released in 2006], which smacks of Pink Floyd here and there, and got quite a lot of good press and is still out there. That all added to my skill set as a mixer, as we had incorporated many live instruments, including guitars, and I had to learn how to record and mix them properly. 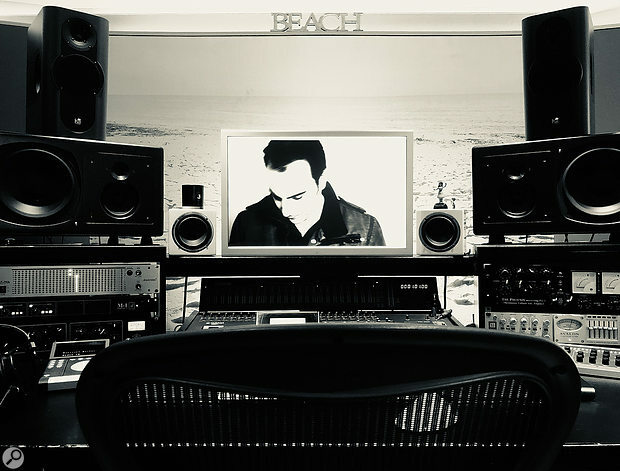 James Reynolds’ own facility in West London is called Beach Studios. When Mr Bang contacted Reynolds in 2013, the mixer had gone on to work with quite a few more big‑name artists. He has typically used a fair amount of outboard, though recent years have seen Reynolds working increasingly in the box. Reynolds used to mix in Logic, but three years ago the mixer went further out on a limb, becoming probably the first, and perhaps the only, top‑level mix engineer who works in PreSonus’ Studio One DAW. “It’s almost too painful to talk about, but I started on Notator in an Atari 1040,” explains Reynolds. “I then was on Cubase for a while, and then I switched to Logic. I stayed in Logic for a long time, rather than moving to Pro Tools, because I found Logic more creative. But when I discovered Studio One I really liked it, and today it is absolutely perfect. 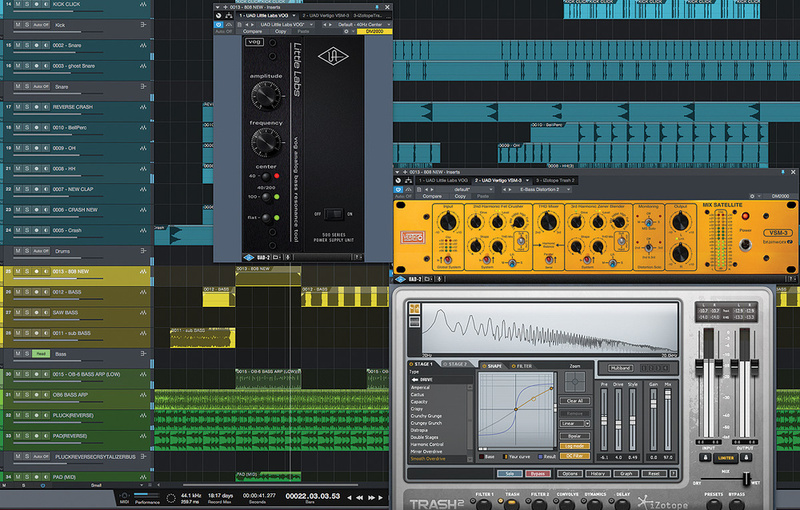 Many Logic and many Pro Tools users have moved over, because Studio One does what both of them do. 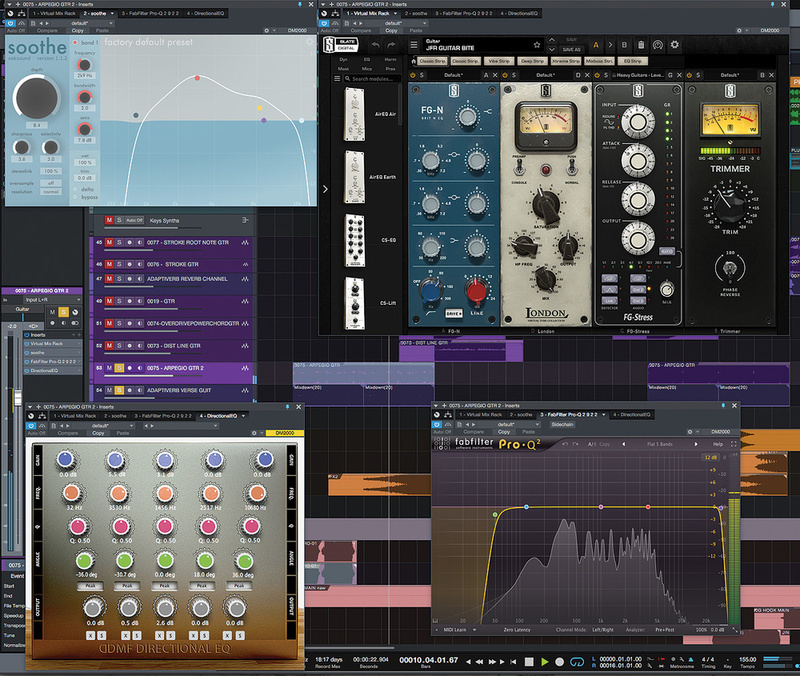 Studio One’s mixing capability is much better, and the automation is much tighter in large sections with lots of plug‑ins. 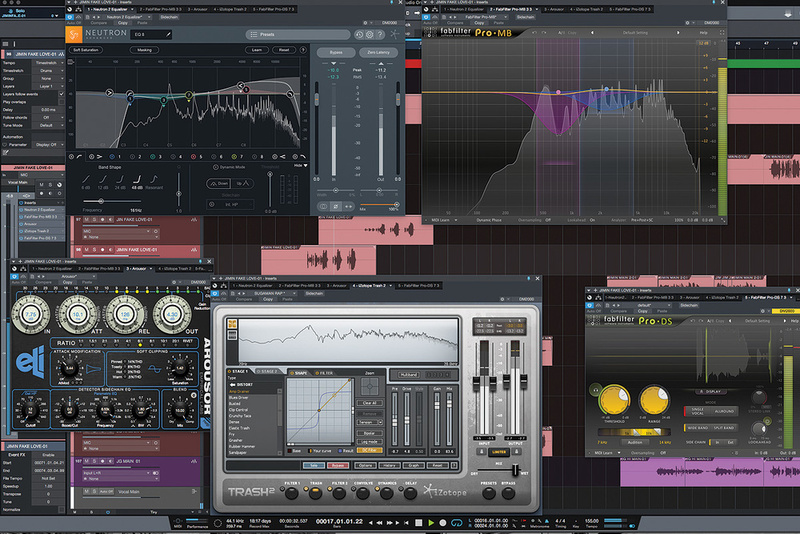 There have for a long time now been problems with the engine in Logic where the automation slips and goes out of time if your session is very big, and that was always very frustrating as it did not feel accurate. 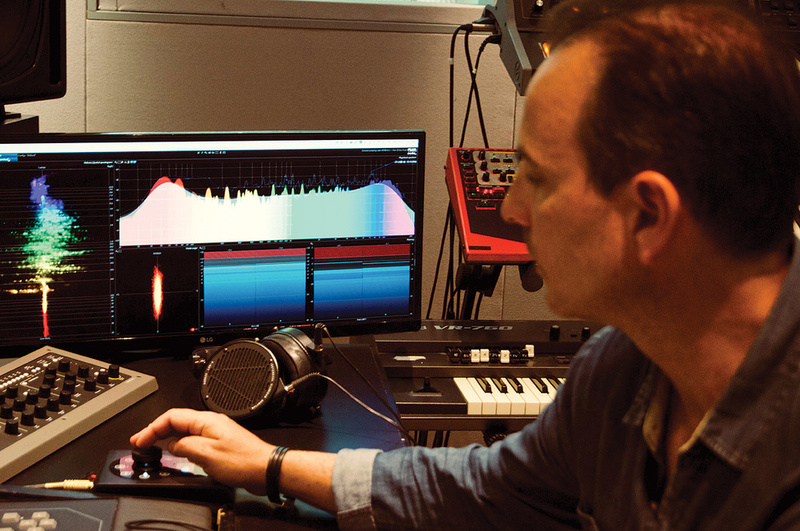 As an ambassador for the product, Reynolds has collaborated with PreSonus on the development of the new Studio One 4 [reviewed SOS August 2018], and in using it for his work he’s putting his mix activities where his mouth is. With regards to the rest of his work environment, he adds, “My hub is my Yamaha DM2000 console, which I can use as a controller or sometimes spread my mixes out on. Though, generally speaking, I am fully in the box. The tape emulation and compression plug‑ins are so good now, and also, the norm is for endless recalls from the labels, so when you have a few mixes going on at the same time you need to be able to pull up your mixes instantly. The DM2000 mostly functions as a conduit to route a signal to my Bricasti M7 [reverb], and to spread all my reference mixes across on, including tracks that are influences, so I can easily flick between what I am working on and my reference tracks. All the above was put to good use in Reynolds’ mix of ‘Fake Love’, the lead single from Love Yourself: Tear. Containing 150‑odd tracks, the session gives a good insight into the ins and outs of a K‑pop production, as well as Reynolds’ Studio One mixing methods. “Because I’m not mixing in Pro Tools, when people send me a mix, I ask for processed stems, without their master bus processing on. However, I like to receive the vocals as dry stems. If they want me to use their vocal effects, I ask that they send them as separate stems. I also ask for the Pro Tools session, so if there is something that I want to undo, I can open it up and get the raw file without the plug‑ins on. Once his assistant has prepared the mix session, Reynolds is ready to get to work. “The first thing I do is I spend some time listening to it, and I read through all the information from the producer and the label owner as to what they are hoping to get out of the mix. I listen to the rough and think about it and gather my thoughts as to what needs to happen, and I make notes. If you jump in too quickly, you might end up going around in circles, not quite knowing what you are trying to achieve. So I try to establish areas that I think can be improved upon, and stuff that I think is great and does not need touching, and then I get on with it. The most important thing when mixing is to understand what is needed. It is a skill in itself knowing when not to do too much! 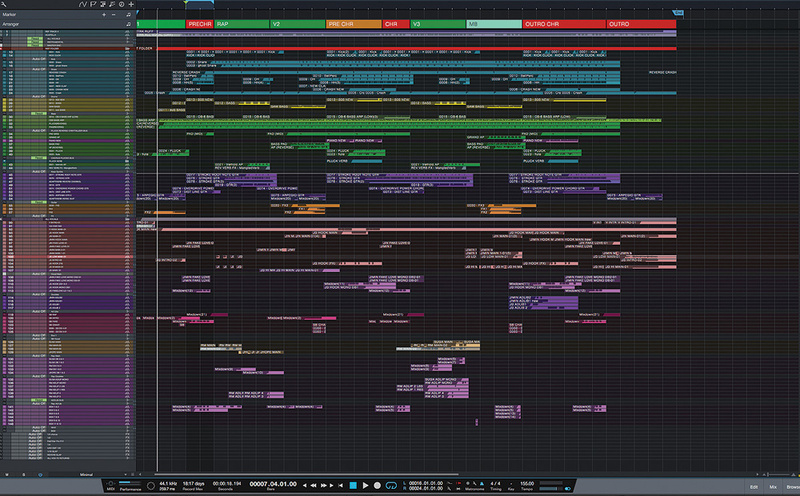 James Reynold’s Studio One session for ‘Fake Love’ is meticulously organised. The structure is clearly delineated at the top, and in addition to the 146 clearly coloured audio tracks, there are two main busses (‘Instrumental’ and ‘All Vocals’), plus 24 busses for individual instrument or vocal types. The former include Kick, Snare, Drums, Bass, Pluck Reverse Crystallizer, Chorus Plucks Bus, Keys Synths, Guitar and FX, while the vocal busses are Vocal Main, Doubles, Ad Libs, SB Vocal, Rap Main, Rap Doubles, Rap Ad Libs, Why and BGV. 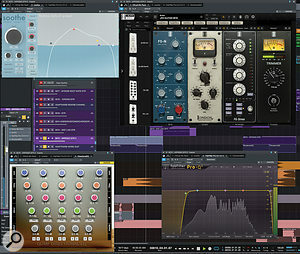 Below that are seven effects tracks containing a chorus, half‑note delay, FabFilter Pro‑R reverb, quarter‑note delay, UAD EMT 140 reverb, 16th‑note slapback delay, and ‘reverb slap’. 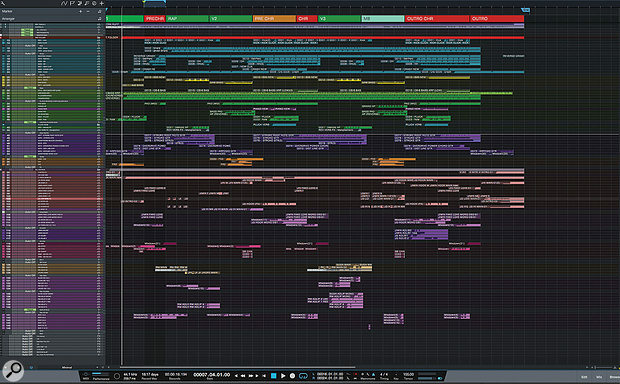 This zoomed‑out view shows the entire PreSonus Studio One arrange page for the ‘Fake Love’ mixing session. 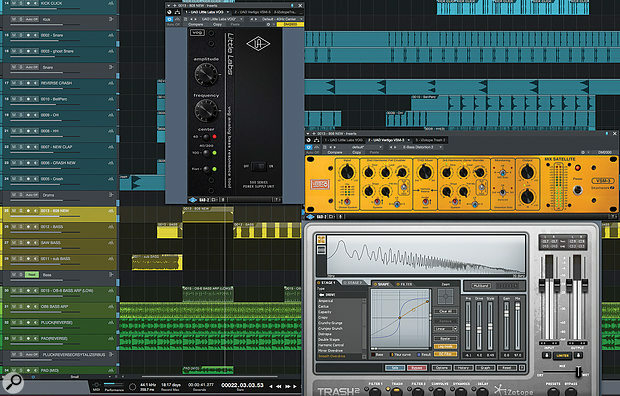 This diverse selection of plug‑ins is used on the kick drum bus. Kick: DMG Audio EQuilibrium, Empirical Labs Arousor, Wavesfactory Spectre, Kazrog KClip Pro, Vengeance Transmitter V3 & DMG Audio TrackControl. Snare: FabFilter Pro‑Q 2, iZotope Neutron Transient Shaper, UAD Ocean Way & Goodhertz Vulf. Drum bus: Soundtoys Decapitator & DMG Audio EQuilibrium. The bass part in the chorus was initially too lacking in overtones to be audible on small speakers, so Reynolds used several plug‑ins to generate additional harmonic content. Chorus bass: UAD Little Labs VOG, UAD Vertigo VSM‑3 & iZotope Trash 2. 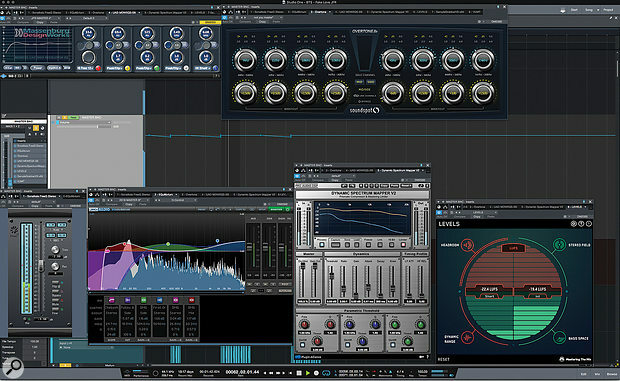 Lead arpeggiated guitar in verse: Slate Digital Virtual Mix Rack, Oeksound Soothe, FabFilter Pro‑Q 2 & DDMF Directional EQ. The arpeggiated guitar in the verse also received heavy plug‑in treatment.“The Mix Rack adds EQ, saturation and compression, and is followed by the Soothe, which does some real magic. It saves you messing around for ages, trying to find all the different nasty frequencies you don’t want! Here it pulls out a couple of frequencies that were getting in the way of the mix. Next is the Pro‑Q 2, which is cutting below 35‑40 Hz, and then the Directional EQ, which is really handy for placing a signal in the stereo field so it becomes a bit more apparent on the left or the right. You might want certain high frequencies on the right so they don’t clash with other high frequencies from a different instrument on the left, for example. It is a really handy stereo‑manipulation tool that allows you to get a really wide mix where you can hear everything that is going on. Lead distorted guitar in chorus: iZotope Trash 2, Soundtoys Effect Rack, FabFilter Pro‑Q 2 & Noveltech Character. Rhythm guitar: DMG EQuilibrium, FabFilter Pro‑Q 2, Vengeance VMS Stereo Bundle, Blue Cat Destructor, FabFilter Pro‑Q 2 & FabFilter Pro‑R. “This rhythm guitar also has a real vibe to it, but it did not need to stand out too much. In terms of the channel strip, EQuilibrium was doing a tidying‑up job, the Q 2 was notching out a couple of slightly annoying resonant, twangy strings, the VMS was widening, the Blue Cat was adding a bit of saturation and distortion, the Q 2 was tidying up any mess that might have been created by the distortion, and I added reverb with the Pro‑R. Everything apart from the vocals and kick drum was routed to the ‘All Instruments’ bus and its plug‑in chain. ‘All Instruments’ bus: DMG Audio Track Control, FabFilter Simplon & Pro‑MB. Jimin chorus lead vocal: iZotope Neutron, FabFilter Pro‑MB, Empirical Labs Arousor, iZotope Trash 2 & FabFilter Pro‑DS, plus sends to Slate VerbSuite Classics, FabFilter Pro‑R, Soundtoys EchoBoy, Waves Factory Trackspacer & FabFilter Pro‑DS. “Welcome to my vocal world! BTS like bright, punchy vocals. There is not a lot of room in the mix because there is a lot of stuff going on, so I am not boosting low end on the vocals, because you are not going to hear that. Instead I’m trying to give the vocals more presence. The first thing I have in the chain is Neutron, which is a great EQ, and I love its dynamic mode. I boost high end with the Neutron, and band three is set to 4‑6000 Hz, with the dynamic mode pulling down any loud ‘ess’ sounds or anything else too sharp. The Neutron is also tidying up the bottom end. After that is the Pro‑MB multiband compressor just reining in a couple of frequencies to control the vocal. “Next is the Arousor, adding some distortion so the vocal is very spitty and present, with lots of attack. After that there’s another instance of Trash 2 set to multiband, which I am using to give the vocal drive and really making it sit solidly in the mix. You have to know how to use Trash 2, otherwise vocals can get too harsh, but in general it is a very good way of saturating and really thickening a vocal and giving it presence. It does depend on the song, I am not always so full on with a vocal! At the end I have the Pro‑DS de‑esser just controlling the sibilance. Sometimes I used two instances of it, one at the beginning and one at the end, but the Neutron is already kind of doing a de‑essing job. Achieving a lead vocal sound that cuts through the mix without coming across as harsh required something of a balancing act from James Reynolds, not to mention the use of numerous plug‑ins! ‘All Vocals’ bus: Overloud Tapedesk, DMG Audio EQuilibrium & Kazrog KClip. 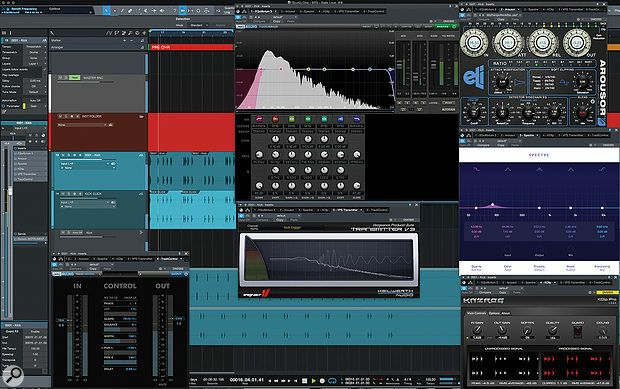 Master bus: Sonalksis FreeG Stereo, DMG Audio EQuilibrium, SoundSpot Overtone, UAD Massenburg DesignWorks, Pro Audio DSP Dynamic Spectrum Mapper, Mastering The Mix Levels & Klanghelm VUMT. “First off I have the FreeG gain plug‑in, because once the mix is approved, I do some gain‑staging so I am not slamming everything as hard before sending it to the mastering engineer. Next is the EQuilibrium, which does a high pass below 20Hz, a side cut sloping gently down 40Hz, a boost at about 117Hz, increases the width of it slightly around 500Hz, and finally there’s a high boost. So it is kind of a mastering EQ. The Overtone also is an EQ but it feels and sounds like saturation, so I am using a bit of that. This particular chain then had the Massenburg EQ, just because I love the sound of it. Here it’s doing a cut at the bottom end, and adding a tiny bit of presence. It just worked for the sound that I wanted. The master bus signal chain. James F Reynolds says that there are a number of common faults that he encounters when he starts mixing a session. “One of them is having the wrong sound for a song. Take, for example, kick drums. With less experienced producers, you sometimes get sessions where there are three or four kick drums layered on top of each other and they are fighting each other and sort of cancelling each other out on the bottom end. It often is a case of finding the predominant one or two and making them work together, or just replacing them. I also quite often add a small kick sound that I put on top just to make it come out a little bit. It is amazing what a tiny click sound can do psychoacoustically for your kick drum. From my own experience of building tracks, if I am spending hours layering sounds, it is just not right. You just have to find the right one. More experienced producers often have lower track counts, because they use better sounds and understand the space used by each part in the track. “Another common mistake is for vocals to be over‑squashed, and sounding too harsh. 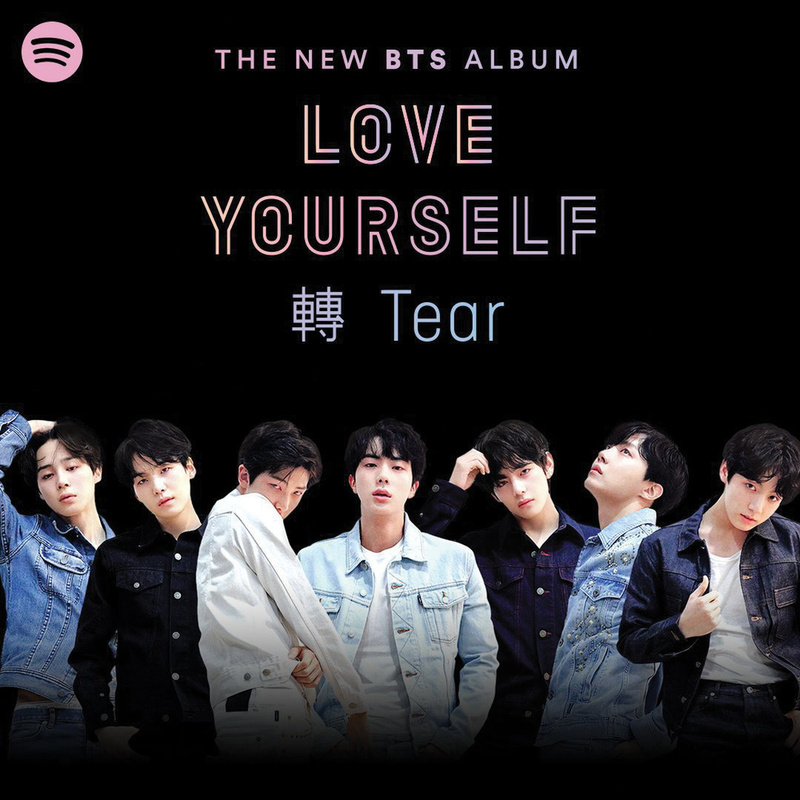 The vocals are pushed pretty hard on ‘Fake Love’, but that is how they like their sound with BTS, because they like things to be quite hard‑hitting and cutting, which fits their style of music. But I often find that people load tons of plug‑ins on a channel or a bus, and this takes the character out of the original sound. So I often need to undo that. These are the situations in which I dig back into the original session to get the raw files. Reynolds’ second monitor, set permanently to display various metering plug‑ins, is visible in this shot of the mixer at work. “I have two screens when I am mixing,” says James F Reynolds. “The left one shows the Studio One arrange window, and the right one has a number of plug‑ins that show me what is going on in my mix. The window on the left looks like a Christmas tree! That is part of the Flux Pure Analyzer System, which takes its feed from my master bus. The ‘Christmas tree’ window shows me the frequencies that are there and their width. I always make sure that I don’t have too much wafty stuff going on below 100Hz, and instead keep those low frequencies quite narrow.